Welcome to Episode 148, Solar Warrior! Today’s entrepreneur has spent the better part of a decade following a very inspiring mission to provide clean electricity and energy access to the world. The medium is a company she cofounded called SimpliPhi Power, and Catherine Von Burg is an inspirational and thoughtful leader with an impressive track record. They have delivered Gigawatts of storage to the US DOD with ZERO defects in an era when battery startups fail year after year. Listen in to hear how she and her team have done it. 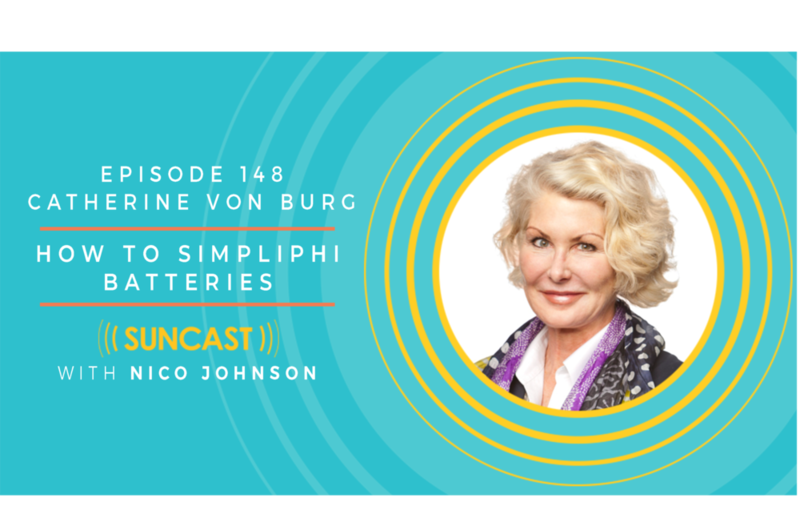 Catherine Von Berg has leveraged her biomedical research and humanitarian background to grow, quite under the radar, one of the most interesting companies I’ve seen in the energy storage space, SimpliPhi Power. She is unorthodox and counter culture in many ways, and exemplifies the spirit of the women we are all honoring this Women’s History Month, but also the spirit of entrepreneurship and leadership that any company would want at the helm. We had an amazing 2 hour discussion, most of which made it into today’s episode. If you’re a fan of longform, consider joining the SunCast Tribe where you can get the uncut version of this and many other epic conversations.